If the front passenger door entry lock function operates normally, but its entry unlock function does not, this means that the request code from the front passenger door is being output normally. In this case, a malfunction in the touch sensor circuit (from the certification ECU (smart key ECU assembly) to the front door outside handle assembly (touch sensor)) is suspected. key system (for entry function) after confirming that the communication system is functioning properly. Confirm that another key is not in the cabin. (a) When the door control switch on the master switch assembly is operated, check that the doors unlock and lock according to switch operation (See page ). (b) Turn the engine switch on (IG). On the Techstream screen, the display changes between ON and OFF as shown in the chart above. (a) Enter the following menus: Body Electrical / Smart Key / Data List. 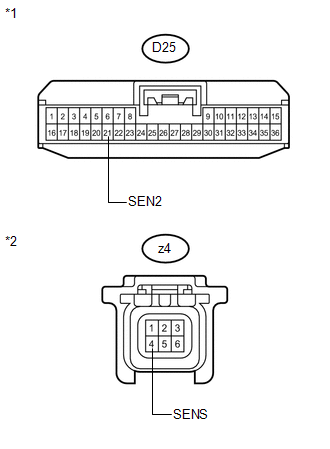 (a) Disconnect the certification ECU (smart key ECU assembly) connector. (b) Disconnect the front door outside handle assembly (for front passenger side) connector. (a) Reconnect the certification ECU (smart key ECU assembly) connector. (b) Reconnect the front door outside handle assembly (for front passenger side) connector. (c) Measure the voltage according to the value(s) in the table below.